Last night SP & I joined a few other Pittsburgh food bloggers for the first 'Food Blogger' meet up at Bocktown Beer & Grill in Robinson. I was, as usual, initially interested in attending and replied 'yes' and then as the actual event grew closer, I got nervous and anxious. What if they all think I am a lousy food blogger? One not worthy of their time? Has anyone even read my blog? What if no one likes me? Why oh why do I do this to myself? I am not good at meeting new people! I am too shy! Can I cancel and retreat into my shell? But we went. And had a very nice time. The organizer of the Food Blogger Meet Ups is Mike from FoodBurgh. We met him last May at a meet up, so it was reassuring to know we already knew one person! Lauren from Burghilicious was there. The photos on her blog are always so gorgeous and mouth watering. Also, Eileen & Greg from Starving Kitten were there. They just moved to Pittsburgh from the Maryland-DC area. I've blogged about Bocktown before, and we have eaten there many times that I have not blogged about! 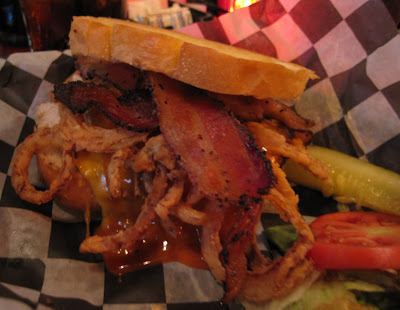 Bocktown is, to us, a hidden gem here in the land of chain restaurants. It's tucked away up on the hill near Target & Pool City, next to a now closed furniture store. There is a lot going on at Bocktown -- beer tastings, live music -- and they are very active on Twitter, Facebook, the social media that I have yet to fully embrace! Check out their site for more details. Last night's Thursday 'Beeried Treasure' was Drunken Pumpkin: New Holland Ichabod Pumpkin Ale infused with Olde Whiskey Hollow Soaked Chips. SP ordered a glass: It came with a sugar rim! I had a sip and liked the taste, for a beer, but since I am just not really a beer girl, I stuck with iced tea. I think everyone else tried the Drunken Pumpkin beer. There also was a bottle of beer to share, courtesy of Bocktown: Cup O Kyndness, traditional Belgian style Scotch Ale brewed with spice (heather). I tried a sip of this, too, and it was just OK. The Drunken Pumpkin was tastier to me, but again, I do not enjoy beer so do not take any beer advice from me! SP ordered his usual: She Crab Soup. He loves this soup and gets it every time we go to Bocktown. It is tasty. 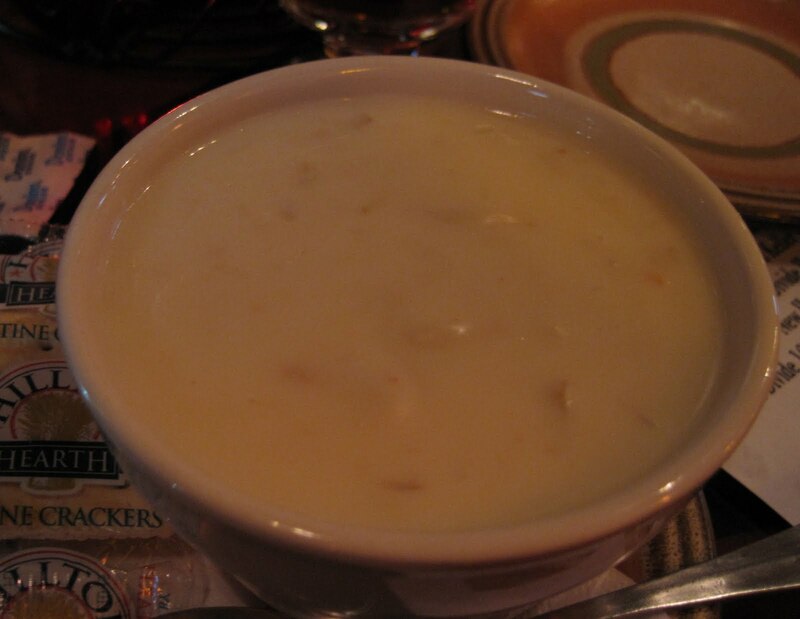 He always crumbles in crackers; I prefer my soups cracker-less. For his meal he ordered a special appetizer of the day: Curried Pumpkin Mussels: green lip mussels simmered in New Holland's Ichabod Pumpkin Ale and finished in a pumpkin curry sauce with fresh bread. 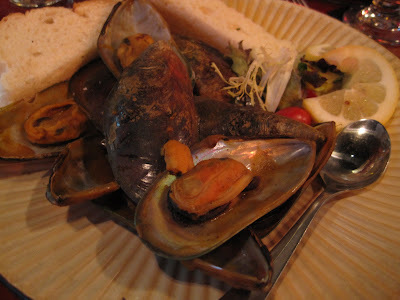 I don't like mussels, so I did not try this dish. SP really enjoyed it. He said it tasted ever so slightly pumpkiny/spicy but that the taste of the mussel still shone through. I ordered my usual, with a twist. I usually get the Bocktown Burgher but I substitute chicken. Last night I substituted portabella. It comes on delicious Italian bread with pepper bacon, onion straws, BBQ sauce, and cheddar cheese. This was tasty. I prefer it with chicken, though. Maybe it was me, but my mushroom kept sliding off and the bread seemed to get soggier faster from the mushroom than from the chicken, so I ended up eating it with a fork. But still one of my favorite sandwiches. Dessert. I sort of wanted, sort of didn't want dessert, but in the end, SP and I shared a slice of the Chocolate Sin tort. 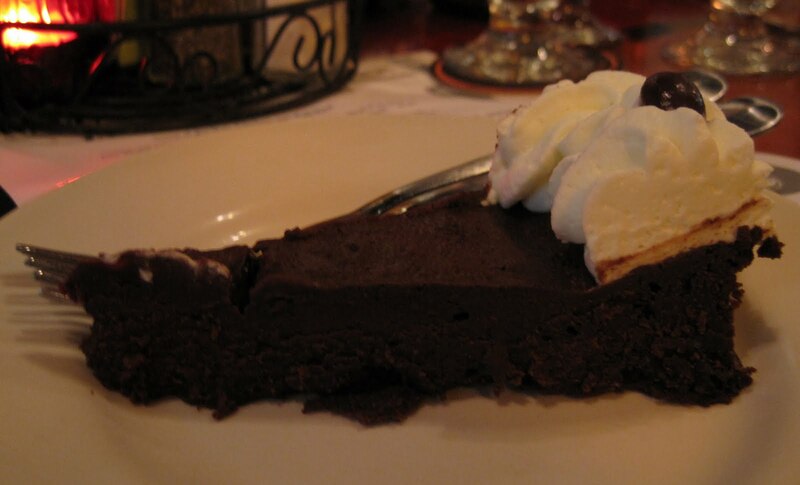 Dense, chocolaty cake with a dollop of whipped cream and a chocolate covered espresso bean. This was good. It wasn't too rich but neither was it weak/light tasting. SP let me have the coffee bean. It was the perfect size for sharing when you want a little something for dessert. I'm not really sure what else to write! The service is always good at Bocktown, and last night was no exception, plus Mike coordinated with Bocktown so they knew a food blogger group was coming. The table was set up and ready when we got there. Extra napkins were provided without us asking (I am a fan of extra napkins, especially when I eat messy BBQ filled sandwiches!). Our server kept up with SP's iced tea consumption (remember, he drinks 3-4 glasses of iced tea when we're out) and made sure everyone had tasty beers. There's a huge selection of beer and the servers are very knowledgeable. Our server 'surprised' Mike & Lauren with their last beers of the night, choosing which to serve them and her choices were well received. SP sampled a couple other beers, I remember one was an 'Albino Python' which looked like a light beer. Our food was tasty. I don't think we've ever had a bad meal at Bocktown. And the company - well, a bunch of food bloggers discussing food and restaurants! It was great! But it wasn't all food talk - we also talked about beer, sports (the Pens game was on), Pittsburgh music and shows at the Benedum... all sorts of stuff. It was very nice to meet the faces behind the blogs and we look forward to future meet ups. That sounds like fun. I'm sorry we missed it! Make sure to spread the word for the next meet up, cause I'd love to join all you fine folks for some good eats.